Nigeria can generate over $10 billion from local and international trade in honey and other hive products annually. Yet the country spends over $2 billion annually on the importation of honey alone, thus missing out on the benefits of developing the entire value chain locally. 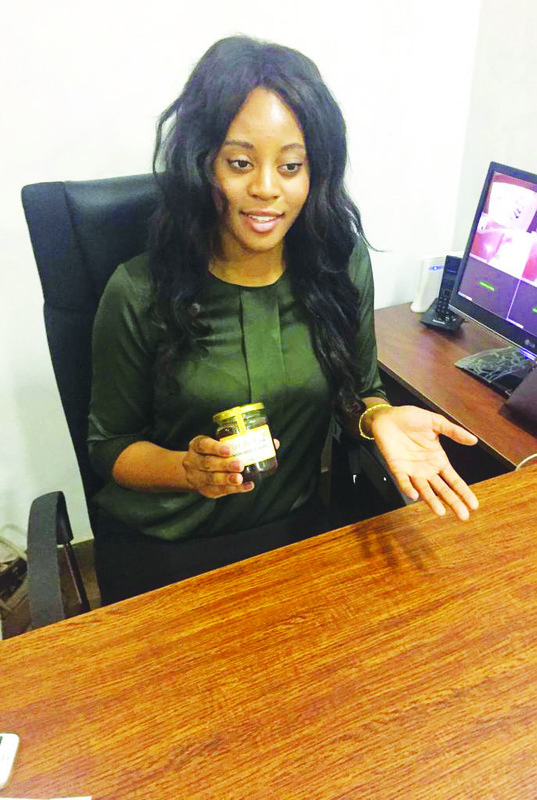 CHIBUGO OKAFOR, a trained pharmacist, young entrepreneur and the producer of Kendake Honey, has developed an expertise in the business as her search for natural and unadulterated honey led her into the business at the age of 24. Now 26, she shares her success story of being an entrepreneur in a challenging environment like Nigeria, in this exclusive interview with NSE ANTHONY-UKO, business a.m. Abuja Editorial Lead. As an entrepreneur, how has the government diversification programme helped your business or affected you? As the government is looking at diversifying more into the non-oil sector, I believe that this is a sector that is worth focusing on.Currently, in Africa as a whole, we import and consume three times more than what we produce. In Nigeria, we import $2.1 billion worth of honey annually for consumption. Someone like me who only has a 100 hives cannot meet up with that demand. We are not able to meet that demand. To import $2 billion worth of honey annually, I mean that is huge. So I think one of our greatest challenges is being able to expand to meet up with the growing demand. 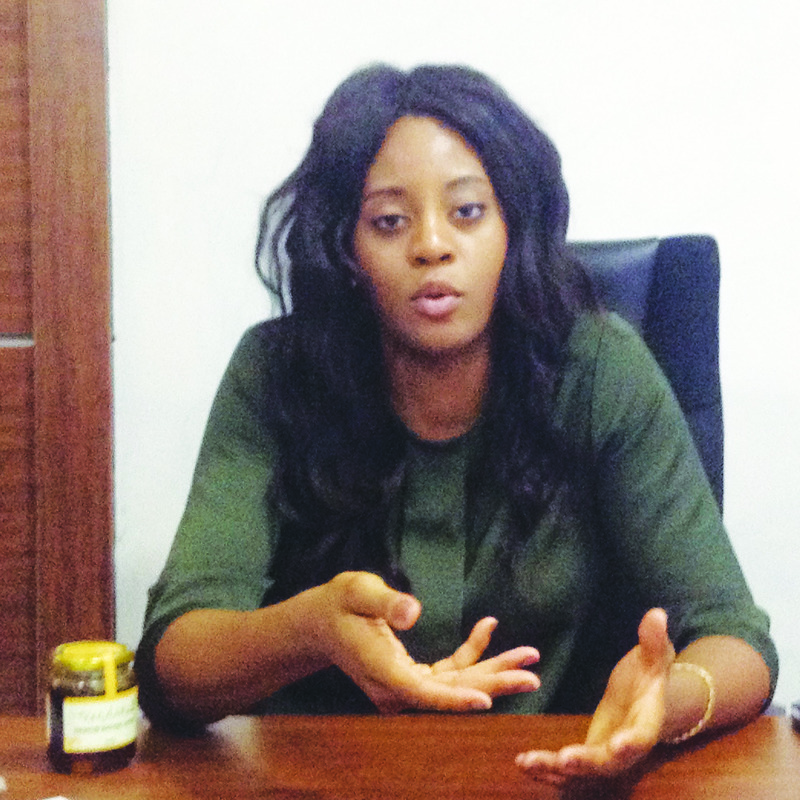 Also, at the moment, the NIPC [Nigerian Investment Promotion Council] is working on a Residual Monitoring Plan (RMP) for Nigeria to export honey. We are not currently on that list. The plan is to be able to ensure that the honey coming from Nigeria into the EU meets their specification. The EU is known for having some of the most stringent regulations when it comes to importing food into their countries. And if you don’t meet up with their specifications your products are turned back. An example was the case of the yams that were returned. For honey it is the moisture content because too much water in honey will cause it to ferment. Talking about adulteration, some people mix water with honey to increase the quantity. But also harvesting the bees too early can increase the amount of water in the honey and that’s because they don’t know. They haven’t been given the technical capacity to know the exact time to harvest. So these are the things we are trying to work on. You heard about the ApiExpo Exhibition in September last year and there were exhibitions around honey. And the number one area of interest for many people was about training, how to get into one aspect or another of the value chain and take it forward. So that is one thing we are actually putting in place to be able to help others. The government has definitely helped me, you know, they offered a lot of training. I think that’s the biggest thing, you know like I said, I told you the journey of how I got here- it wasn’t what I planned. I wasn’t familiar with the traditional methods of how to actually get on the ground and produce honey and I had been offered a lot of support from quite a few of the governmental organisation so they have been very good to me. What aspect of the honey production process do you undertake? Kendake Honey is involved with the production, the processing and the packaging, so we have adopted the whole value chain. Initially, we only wanted to get involved in only the processing and packaging. Unfortunately in our search for unadulterated honey we weren’t very successful in finding that. We went across Nigeria, Taraba, Benue, Kogi, Nasasawa everywhere, even Enugu where I am from. And we weren’t successful in finding large quantity of unadulterated honey. And also adulteration doesn’t mean that people are intentionally trying to mix foreign products into the honey. Adulteration also means not being able to adequately extract the honey from the combs correctly so you are finding that sometimes there may be remainders of bees’ wax or dead bees in the honey and these also adulterate the honey. So we decided to start a farm ourselves. We went out to Keffi, we produced 50 hives there, and we produced honey there. And later we added another 50 hives in Enugu. We have been supported quite well by the federal ministry of agriculture and rural development in terms of training. They have helped us a lot in fine-tuning the correct bee keeping practices. The bee keeping industry has been around for centuries before anything even came up in terms of legislation but I think the real issue has been getting the correct Bee Keeping technique to produce good quality honey for consumption and that is where the ministry has been very supportive in doing for us. What inspired you to start Kendake Honey? Kendake Honey was founded in March 2017 and has become something like my baby, quite personal to me. What sought of collaborative efforts are there among honey producers first to meet the demand for local consumption and then for export? That exhibition that happened in September was huge but I think the biggest part of it was the fact that people from across Nigeria were able for the first time in a long time able to meet together and we were able to form network groups from that and we have all been able to share knowledge and get a better understanding of the seasonal variations in terms of harvesting and there was so much information sharing among ourselves. Actually as we speak, there is an ongoing training across the country. It started in Abuja, they went to Akure, and are currently now in Kano and I am working on making sure that they will start up in Enugu as well. In these trainings we are teaching people on techniques. So that even if you are new in the industry you can do things correctly , so that together we can all produce enough to, like you said, be able to meet up with that national consumption so that we no longer have to import $2.1 billion worth of honey annually. We have bee keepers in abundance all across the country its more about learning how to maintain the m correctly to make the best out of it. I think there isn’t enough support for youths who don’t have that capital, the seed capital to get into the business. There also isn’t enough available information or research around how to get their business to grow within our environment. First, if you see what I mean, there isn’t enough available information to say, okay, here are the step by step processes to get registered by NAFDAC [National Agency for Food & Drug Administration & Control] or whatever industry he is in and another point I think is that people within the industry are actually going out in sort of sensitization programmes to then look for these talents and work with the talents to help grow them. A lot of the times you are the one who actually has to go out of your way to find them and that can be quite discouraging. What are your priorities in terms of expanding the business? We are trying to go all over Nigeria, like I said, $2.1 billion worth of imported honey is huge. So it will be nice to try and make sure that we boost the economy through job, wealth creation. We are trying to expand to the level that it’s not just about the company. This is a social business. First of all, we don’t employ anybody that is not a youth. Because that’s me, I am a youth and I understand the barriers that exist for youths especially young women like myself in this industry. So those are two of the requirements for even working with the organization. We are trying to make sure that we share wealth within that group, the youth and the women. That $2.1 billion, why not put it on ground in Nigeria and the economy of Nigeria would be boosted. I really believe this industry can do it. There are so many products involved in the process, it’s not just about the honey, there is wax, there is populace, I even learnt the other day that after using the honey comb to make wax some of the residue goes on for use in pig farming. It’s what is used to feed the pigs. Normally I would throw that away but I have now learnt that I can sell that to the pig farmers. So nothing is wasted. There are so many areas within this industry that generate wealth for the nation. That’s the kind of vision we have for expansion. Focus on Nigeria and create wealth within the economy in Nigeria. We also plan to increase the capacity that we are producing right now. Currently per farm is 700 litres of honey and we have to increase that and we are also looking at techniques. There are variation hives that produce more or less honey. At the moment, we use basic technique, which doesn’t produce the most amount of honey. Secondary I hope to be not only in stores but to have our own stores where people can come to us to get all sought of products under agriculture and be able to buy from us. Currently we distribute to stores and supermarkets and do also of sales online as well. How many people do you employ currently? We have ad-hoc, temporary people. We are in a community Bee Keepers in Keffi and there are well over 1000 hives, many are traditional hives though, so there are people who work around all these hives and also work for us. Then we have about 15 people working directly for us. We are really trying to make women income generators in their homes as well so that they can sustain their families. That is very important to us. How easy is it to access the capital to start this business and finance expansion plans? It was something that was quite difficult at first. Luckily for me, I will say that I was surrounded by a good network of family and friends who believed in my business. As a young woman, that has been very difficult. In a lot of culture if you move around Nigeria you would know that there is a barrier that exist for women to have ownership to land. In my case I stand out in that sense as it is not something that is normal in Nigeria. In terms of financing, I have had some people say to me you are not married so we cannot give you loan. And I’m like “but I am doing all these things.” Some others say that I need to add weight and have a madam body and then we will know that you are serious. This is the day to day reality, typical of some of the things that get thrown back at you and I am trying to move up but there are barriers because socially in Nigeria it is not acceptable for a woman to own my own business and moving forward. So there have been barriers to accessing finance. A lot of it has been personal savings and fund raising as well as loans from family and friends but I understand that again I fall in minority of those you can raise finances that way. Up I know there are lots of upcoming loans that have low interest rates and I am actually looking that not having collateral, that’s another thing. So for me, earlier on when I started this business to even access a loan you’ll need collateral which something I didn’t have except the farm, and that’s a huge risk because of what you are doing unless you want me to put up my father’s house. But now there are some collateral free loans and the interest rates are very low. They are from the CBN and Development Bank of Nigeria (DBN) but you don’t get it directly from them it has come through your bank. So that’s another option for people starting something new but don’t have access to finance and they don’t have any collateral as well because of their age or whatever it is they can go through. Have you accessed any funds that came from these organisations? As a trained pharmacist, you studied this in school do you think you will ever leave you business and go back to your actual profession? Well am a very young woman, so by God’s grace I think I have a lot of years ahead of me so I would never say that I would forget about my background or what I studied. But I do also think that the honey is a step. It’s just that this is a natural alternative medicine it still falls under the medical field and a lot of honey is actually used with the pharmaceutical industry as well as drugs and it is also used in the process of being researched for anti – cancer it actually kind of ties in but I do understand when people think that oh! She is in the agricultural, but like I said I do not think I can get rid of that. What do you advice new school leavers who are thinking of venturing into a new business? Think it through first. It is one thing to be passionate and say oh! I want to get this done and get on the ground. It is amazing it is a pretty much one of the biggest characteristics you need to start a business in Nigeria, however I think you need to think it through, don’t carry a business idea without taking into the reality of what is actually on ground in Nigeria so do take your time to think it through. Do preach it to your friends, preach it to your family as people always have or think of things which you may not have seen and pray. Have you been following the issues surrounding the African Continental Free Trade Area, (ACFTA) which is supposed to open up Nigeria to a market of 1.2 billion citizens, how do you think it will affect your business if Nigeria signs or does not sign? Are you saying Nigeria should sign as an entrepreneur? Well as an entrepreneur in the honey market specifically where it affects me, I would say definitely, it would boost my business. What is your driving force to continue in business? I want to make sure that Africa’s resources are being shared with the rest of the world by Africans. It is important that it is us sharing our resources with the rest of the world which has not being the case. It has always been them coming to exploit what we have. So why don’t we reach the same international standards and specifications and be the one to move our natural resources and share them with the rest of the world at great levels, great standards. PreviousTony Elumelu Foundation to train 50 additional Beninoise entrepreneurs.